An 18th century old factory in Leicester has opened its doors for the first time today after a £7.1m restoration. Friars Mill includes the former Donisthorpe factory, which was badly damaged by a fire in July 2012. The site had stood empty since 2005. 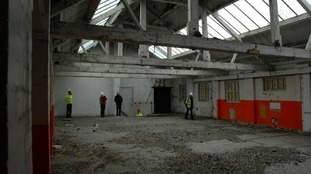 The site has now been handed over to the East Midlands Chamber, who are looking for businesses to base themselves there. “The redevelopment of Friars Mill has been a challenging journey. The main Donsithorpe factory was nearly lost to fire, and the other buildings on the site were largely derelict after years of neglect. “I am very proud that we were able to bring these buildings back into a meaningful and fitting use. The £7.1million redevelopment of Friars Mill was brought back to life by Leicester City Council. It was part-funded by an award of up to £3.9m from the European Regional Development Fund. It provides 25,000sqft of modern, managed workspace, with units ranging from 600sqft to 1,950sqft, along with meeting rooms, breakout spaces and a reception area. “Friars Mill is an excellent addition to the Chamber’s managed workspace portfolio and we aim to replicate the success of the Leicester Food Park, which we have managed on behalf of the council since November 2014. “We’ve already received a high level of interest in the site from businesses. It is a very prestigious site in a wonderful location, which combines elements of the city’s industrial heritage with cutting-edge, modern design to create a truly unique place to do business.